The premier source of wisdom and magical lore for decades. 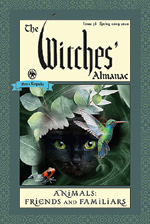 Beyond the lunar calendar information, The Witches' Almanac serves as a valuable reference source. Articles on a variety of topics appeal to the Wiccan practitioner and others interested in magical lore. Covers Spring 2019 - Spring 2020.